Superman stops the toy threat, and then follows the signal to Toyman's camera before it self-destructs. Jimmy goes to explore the ruins of the battle. Toyman figures out that Superman is reacting to a frequency. Jimmy is robbed of several dollars, and calls on Superman with the watch. Superman, unimpressed by Jimmy's next use of the watch for relatively nothing, leaves in disgust. Jimmy uses legwork to find Toyman, but when he arrives, Toyman ambushes him, having figured out that the watch is what calls Superman. He moves in to cut off the watch...and the hand. Story - 2: It's not that this is a horrible story, or a bad conception, or a bad realization. The writing isn't really that bad. I mean, it's decompressed, but it's not that bad. The real issue here is the fact that everything here just seems to have very little meaning or relevance or fun. It's just going through the motions. We've seen this story before, on multiple occasions, so to tell it again there should be some kind of hook or reason to do so. I suppose the reason is to introduce a new generation to this story, given that it hasn't been told for a while, but in my view the basics of a character history in the age of a multiple media is generally acquired through cartoons, not comics. At least, in the age of Wikipedia. There's also the pace. A whole page for Superman transforming, which sometimes justified, here just doesn't seem to be. The fight with the toys was relatively abrupt and didn't justify the huge buildup. Jimmy's characterization is decently done, but he's also one-dimensional in many respects. There's no deeper meaning to this script, and it's just fine with that. I'm not. I want more. The actual breaking is pretty well done. The way each character realizes their role is fine. The problem is, I just yawn and go, "Uh, why should I care?" Art - 3: The more I see of this arc, the more I realize that the problem is not Phil Hester, whose work I enjoy, it's the fact that it's less suited to Superman, and more to subtleties of character. He's good with emotion, and bold expression. I see him as the kind of guy who, if Oeming died, would be the only guy who could do the Powers schtick and come across as serious and great. 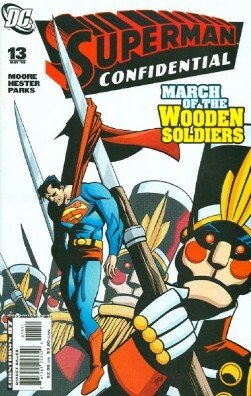 Here, however, it seems a bit dark and blocky for Superman to my tastes. I can see how other folks would see it as great here, though. Cover Art - 1: Kinda childish, a but awkward, and odd coloring choices all around. It's kind of a glaring cover, and totally pulls me away from the story as opposed to towards it.